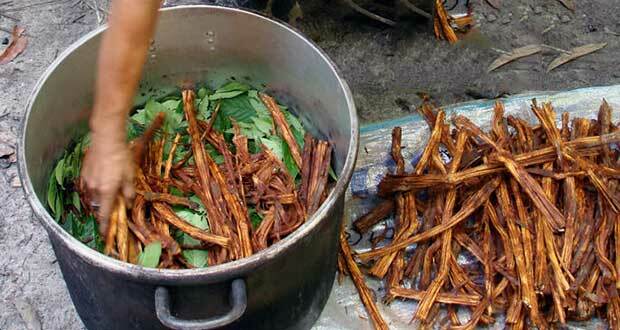 Ayahuasca is a sacred plant medicine that has been worked with by Amazonian medicine men since ancient times. It is a liquid brew created by boiling a specific vine which contains DMT. It also contains another plant which inhibits the breakdown of DMT while in the system, allowing for a long experience of the effects of DMT, leading to prolonged visionary and transcendental experiences. Ayahuasca is used in ceremonial and ritual settings for healing, receiving information, and other ritual purposes. To the peoples in South America who are familiar with this medicine, they will find it as no surprise when modern science finally proves the medicinal and healing properties of Ayahuasca, as many could say they have seen Ayahuasca heal even the most serious of illnesses, but as we know, it takes conclusive empirical evidence for the scientific community to come around to the idea. As this medicine is making its way into the realm of western culture, it is being explored as a possible treatment for conditions ranging from depression to cancer. Because Ayahuasca contains Dimethyltryptamine (DMT), which is highly illegal as a Schedule 1 drug according to the U.S. Controlled Substances Act as well as the International Convention on Psychotropic Substances, it is a difficult subject to approach for research. However, one scientist is stating that he believes it promises real medical benefits particularly for cancer. Eduardo E. Schenberg, who works for the Federal University of Sao Paulo says, “There is enough available evidence that ayahuasca’s active principles, especially DMT (N-dimethyltryptamine) and harmine, have positive effects in some cell cultures used to study cancer, and in biochemical processes important in cancer treatment, both in vitro and in vivo, therefore the few available reports of people benefiting from ayahuasca in their cancer treatment experiences should be taken seriously, and the hypothesis presented here, fully testable by rigorous scientific experimentation, helps to understand the available cases paving the way for new experiments.” Schenburg wrote in an article that was published in Sage Open Medicine. Despite Schenburg’s conviction that Ayahuasca deserves a closer look through research, there is currently very little solid evidence to actually prove the medical benefits of this exotic plant medicine. Most of the cases where the plant medicine has been reported to heal or treat serious conditions are anecdotal and the belief that Ayahuasca has genuine medical benefits has yet to earn its place in scientific proof. Although science behind the healing properties of Ayahuasca or other plant medicines are still formative, when looked at from another perspective it makes sense that this ‘vine of the soul’ in the form of a medicinal brew would be capable of healing patients on many levels. As with other consciousness-expanding plant medicines, Ayahuasca leads to an extremely expanded perspective of existence and the self. From such a perspective, it is possible to viscerally see the ‘bigger picture’ of one’s life and experience and thus ones illness or emotional and physical state. From an expanded state such as this, one feels a greater sense of connection and unity with source and with all that is and is thus highly likely to be willing to let go of baggage, trauma, or belief systems that are hindering well-being. Likewise, a person drinking this plant medicine may be able to understand and come to terms with their illness, finding peace and solace whether or not they are to recover. This, in itself, is a profound form of healing. Healing is not merely the obliteration of illness, but the acceptance of oneself and the integration of all experiences. As with many ancient herbal preparations that are still used today, science has great ‘aha!’ moments when the healing properties of such herbs are uncovered and indigenous people merely laugh because what science has taken millennia to uncover using ‘modern methods’, the original people have known since time began. It is only a matter of time- or a slight shift in vibration- before science catches up to what the ancients have always known.